It was essentially a must win for the Pittsburgh Penguins to remain in the Metropolitan Division race when they took on the New York Islanders. But in a tight, low-scoring game it wast the Islanders who prevailed and strengthened their standing in the Metro, beating the Pens 2-1. The loss puts Pittsburgh 5 points now behind the Islanders with 2 more game played and 8 points behind the Rangers with a game in hand. Even with 2 games remaining against each team, it's getting increasingly likely that Pittsburgh will move up out of the wildcard slots unless they go on a tear and/or the New York teams falter. Marc-Andre Fleury stopped 25 of 27 shots on goal, with the only 2 coming on Islander power plays, but it wasn't enough as the Pens offense was held to a single Kris Letang goal. There weren't many scoring chances to open the game. The Islanders rang a shot off the crossbar behind Marc-Andre Fleury a few minutes in, but neither team got particularly close to scoring until Patric Hornqvist was called for a hooking penalty midway through the period, and the Islanders quickly made the Pens pay when John Tavares' shot deflected off Brian Dumoulin's stick and into the net behind Fleury to make it 1-0 New York. Things got a bit heated a few minutes later when Evgeni Malkin and Travis Hamonic, after a series of crosschecks back in forth, got in a "fight", the Penguins' second "fight" in as many games. Hamonic dropped his gloves while Malkin didn't, but neither really got much in the way of a solid punch in before the refs broke them up and send them off for roughing. On the ensuring 4 on 4, Fleury took a Johnny Boychuk slap shot off his helmet that appeared to leave him a bit woozy, but the Pens gathered the puck and took it down the ice, where Kris Letang snapped a shot from the right dot over the glove hand of Jaroslav Halak for his career best 12th goal on the season. The goal seemed to light a fire under the Pens as they started controlling the possession and pinned the Islanders in their own zone, but they were unable to take the lead before the horn sounded and they entered the first intermission tied 1-1. 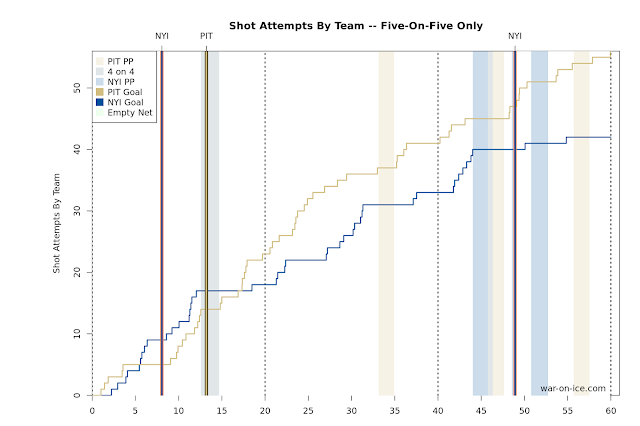 The Pens continued to drive possession in the 2nd period, including one in the opening minute, and they managed to find chances off the rush through much of the first half of the 2nd. Bryan rust rang a backhand shot off the post about 5 minutes into the period, but despite the chances the Penguins weren't able to translate that to goals on the scoreboard. 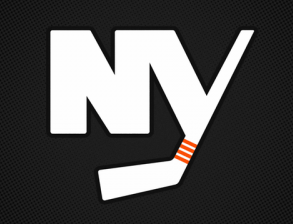 New York had arguably the best chance midway through the period when Tavares stripped Chris Kunitz on the Islander blue line and took off on a breakaway, but he was unable to get a shot on goal. The Penguins got a power play with just under 7 minutes remaining in the period when Nick Leddy went off for cross-checking Patric Hornqvist with a chance to take control of the game, but the Islanders were up to the task and killed off the Pittsburgh opportunity. The game entered the second intermission still tied 1-1, and it began to take on the feel of the team to score the next goal going on to win the game. Both teams pushed for the go-ahead goal early in the 3rd period, and the Islanders got a break over 4 minutes in when Phil Kessel went off for slashing. They weren't able to take advantage, and with 17 seconds left in the man advantage Anders Lee got sent off for slashing Brian Dumoulin in front of the net. The penalty then gave Pittsburgh a prime attempt to pull ahead, and Malkin had a great opportunity in front on the 4-on-4 but couldn't score. The Pens couldn't convert on the power play despite a couple decent opportunities, and Matt Cullen ended up taking a cross checking penalty shortly after the penalty to Lee expired. This time the Islanders would take advantage of the man advantage when Nick Leddy wristed a shot from the blue line that deflected in off Lee in front. The Penguins had a great chance to tie it back up seconds later when Halak left the rebound on a Malkin shot from right of the crease loose in front, but the Islanders were able to beat the Pens to the puck to clear it away. The teams would trade power play chances over the final half of the 3rd, but the Islanders did enough to make the 2-1 score hold up. The Penguins weren't able to turn their possession advantage in the scoring the needed in this game, but in what's becoming routine they controlled the possession in this game with a score-adjusted 56.5 CF%. It's a loss that hurts in the standings, but with the Red Wings losing to Columbus the Penguins maintain the first wildcard in the Eastern Conference, and with their struggles within the Metro it wouldn't be a bad thing if Pittsburgh ended up in the Atlantic Division bracket for the playoffs. The Penguins will get a much needed two days off before facing off with the Blue Jackets in Columbus Friday night.